Thanks again to everyone who's contributed already. It's amazing and heartwarming to me that so many people gave without me having to beg. There has to be an end date for the campaign and I chose today (actually midnight PST which is 8am GMT) so that I'd have the bulk of funds before I went away. Credit Card donations are held in escrow until the end of the campaign and I won't get them until Friday. So if you want to give something *before* the trip has started, maybe you didn't realise it was going to close or perhaps you've changed your mind reading this, please do so. * helping create a repository for a large amount of detailed source materials, licenced for use by anyone with some rights reserved. However, while I've paid for my flights and have enough for basic expenses for the time being, I need to find some other ways of raising money to fully cover my overhead while I'm away. This is not only my rent (which is due towards the end of the month) and utility bills but also the weekly contributions I make to my children. I'm open to suggestions on how to do this – I'm not necessarily convinced that it needs to be another indiegogo campaign, it might simply be about encouraging one-off micropatronage donations – I trust that you'll all have better ideas than I can come up with. If you’re wavering, like @robnonsense how does this sound? We're into the final hours of the indiegogo campaign and I'm preparing to fly to San Francisco tomorrow morning. "I'm still making my mind up whether to contribute. Partially that's because I'm not sure I'll enjoy the content that much… I mean, I know it will be interesting, and insightful and potentially funny in places; but my jealousy of your trip may ruin it for me!" Would this kill the art? Would you want a bigger cut?! (I'm asking because I find this really interesting, and would love to hear your answer… and because part of me thinks if you want to co-fund something, you should profit share… "
So I wholeheartedly agree with the sentiment, but don't feel comfortable with the profit-share idea as a solution. I do want you to benefit from the material I create, I want to share it, I want you to be able to find insights and meaning that I'm not able to see, but I don't want to feel saddled with the responsibility for making a financial profit – even if that's not what people are expecting, it's an expectation that I would put on myself. What it shows me is that I haven't made something explicit that I think I made explicit last year – doh! I've left something assumed that is actually quite important. I've said that I will write a book and make a movie out of the material that I will gather on the trip. What I haven't talked about is what you will be able to do with that material. Would it change your mind if I were to say that all the material I collect will be made available online under a Creative Commons licence (probably by-nc-sa) ? So that I'm creating a free to use repository of research material which you can delve into? I would retain the copyright of it all, but you could use it without asking permission if. you attribute me as the original source, you don't charge for what you do with it and you share it under the same conditions? So rather than investing in something that needs to be a business, you'll be investing in me creating a common good. If you do want to create a commercial product based on the material (or use the material in any other way not covered by the license), then I am likely to agree, but I reserve the right to be asked first. The other thing I've left unsaid is that I'll do an event for those who contributed and can get to Central London to explain what I found, what happened and what material is available. This, incidentally, is almost the same as how Tuttle works – any member can make anything they like out of what goes on there but only I get to use the Tuttle name on commercial offers (and those have involved profit-share) – and I think that's why people who know me from that sphere have been more willing to just jump in. 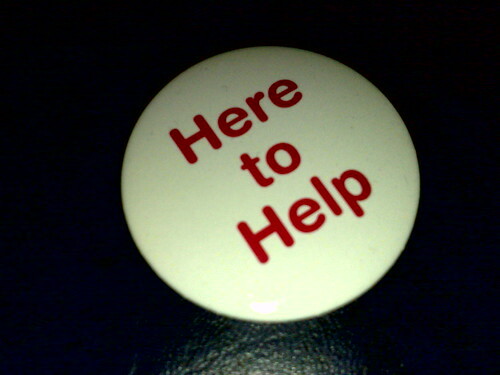 This badge is an aide-mémoire – it reminds me both that I am here (right now) and what I'm here to do. In the excitement of preparing for the trip and talking about it, answering questions and asking for help to just get over to San Francisco tomorrow, something has become a little obscured. I believe that the most important factor in the creation and conversion of social capital (and that's what this trip is supposed to be looking at) is for me to be of service to those around me, to focus on what I can give to each situation rather than what I can get from it. So my first question for people I meet on the road will be "How can I help? What do you need doing?" rather than "What do you have for me?" Now I will forget this again and I will slip up from time to time – I'm not perfect. But I will be reminding myself daily that, assuming I have what I need in terms of basic food, shelter and transport, my primary focus has to be on what I can contribute to those around me. I know from experience that my ability to do this will be enhanced when I'm able to remain present to what is going on right now, rather than what happened earlier on or what might happen next. That's one of the reasons for me writing about the trip as I go, it helps me put away things that are done with. It's also why I change the subject when people talk about planning – it's not that I have a philosophical beef with planning, more that I tend, if I give myself over to drawing up plans, to focus on what's not happened yet rather than the here and now and that means I miss out on important stuff. So I'm here. And I'm here to help. I also started talking to people about the first few days on the west coast and meeting up. I need more sleep and less food for the troll. I think, both for my own peace of mind and to avoid that pained look when people ask, today's the day to book my flights. I fly to San Francisco – that's simply the place on the West Coast where I know most people and gives me most flexibility for where to go onto next. I fly back either from NYC (Newark) or Boston again on the basis of "most people known" but which? There's a £14 diffference between the open-jaw fares back from these (Boston's the more expensive). Will Rowan has offered to buy me a burger in NYC on 30th. Do I make that decision, on the basis of first-come-first-served? Virgin Atlantic today offers LHR->SFO on 1st and EWR->LHR on 31st for £460.27 I think I'm going to go for that unless anyone comes up with a compelling argument otherwise. Of course if you know (or are) anyone in Virgin Atlantic or any other airline who can make this cheaper or free (in return for any of the things I can do) TODAY or before prices go up then please get in touch. I *was* very tired last night after I wrote. I was in bed by midnight and I slept until 10am this morning although I had a little wake-up-with-busy-head session for an hour or so around 6am. I was reminded that I need to remember to take the big but difficult actions that I know will make progress rather than focusing on lots of peripheral stuff that's easy but doesn't get much done. Another $260 came in via indiegogo. I was also reminded that when I put stuff out there, there are people who don't get it immediately and they ask questions and offer criticisms. I have to have a way of dealing with that, that isn't just about sweeping it away and saying it doesn't matter. Yes "h8ters gonna h8" but I gain a lot more from engaging with questions and ultimately understanding the ideas better myself. Having criticism voiced also drew out some thoughtful writing from supporters. Thank you. I'm keeping a video diary that I'm not publishing yet. I expect to weave it into the movie. I don't think I said anything in tonight's entry that I didn't put in posts today so it's not keeping stuff secret, just that I want to be able to thread the story together including some stuff that isn't released immediately. One of the great things about putting this work in front of a wider audience is that people are engaging with it who don't already know me, like me, understand what I'm doing, get the way that I work. That means I have to keep explaining it from different perspectives and not only does that hopefully help them understand what this project's about, it helps me understand better too. I think there are a couple of ways in which my approach is unusual. Firstly this really is an experiment. An experiment in which I truly don't know how things are going to turn out. We generally don't do this. In school when we do experiments, we're actually repeating a specific step-by-step process that someone else has gone through that has a known outcome and an intended educational point. I don't really do things step-by-step, I resist structure and rules like that. If I'm doing anything step-by-step exactly the way that someone else has done it, I'm not aware of it. According to his blurb, Paul Smith set out to get as far as he could around the world for free with a target of New Zealand, while holding certain rules about the circumstances under which he would accept help, including that he could only take help from people on Twitter. That's not what I'm doing. I'm improvising a journey through my online social network where some of the nodes are already known to me and some aren't. Paul seems to have done it to show that it could be done and the extent to which you can find help on the road. I'm building on that to look at what all these relationships mean and what the value is. And while I know that my outcome is that I will return home at the end of the month, I don't know what the overall outcome of the project will be, I don't know how my relationships will be altered, augmented or diminished, I don't know what I'll learn about America, Americans and myself. At the end, I'm expecting to be able to say something interesting and useful around the nature of social capital, its dynamics and value, but I'm entirely open-minded as to what I might say. The aspect that makes all of this more novel is that I will also be writing about it as I go. I'll be doing the equivalent of publishing my notebooks and source materials as I go. So when I say I'm going to write about my journey the question is how does that differ from any travel writer? Well most travel writers (film-makers) don't write their book (make their film) in public, they squirrel away lots of notes and draft scraps and then pull them together for publication (screening). And mostly they don't involve their "audience" in what they're doing until the travelling bit is done. I've been involving you in this from the start. For most people out there, this way of working is unusual. It's not new, but I think that it produces more interesting work than traditional approaches. It's certainly the only way that I seem to be able to do anything.